Kingston, the capital, the largest city, and chief port, of Jamaica, is located on the southeastern coast of the island country. It faces a natural harbor protected by the Palisadoes, a long thin tombolo of sand that serves as a natural protection for its harbor and connects Port Royal, the center of shipping, to the rest of the island. Founded in 1693, under English rule, Kingston became the prosperous center of Jamaica's trade, and a trans-shipment port for goods and slaves bound for Latin America. 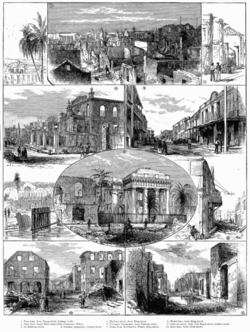 Fires in 1862 and 1882 extensively damaged the city, and an earthquake in 1907 killed 800 people and destroyed numerous buildings. In the early twenty-first century, the migration of unemployed people to urban areas, coupled with an increase in the use and trafficking of narcotics—crack cocaine and ganja (marijuana)—contribute to a high level of violent crime in the city. Kingston was the home of a number of reggae stars, including Bob Marley. 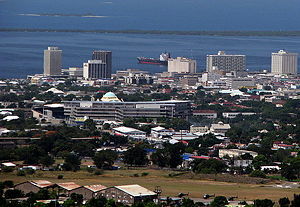 In the Western Hemisphere, Kingston is the largest predominantly English-speaking city south of the United States. The paying section of Hellshire Beach looking east towards the Blue Mountains. Kingston sprawls along the southeastern coast of Jamaica, around its natural harbor protected by the Palisadoes, a long sand spit which connects Port Royal and the Norman Manley International Airport to the rest of the island. The spit has been developed as a recreational and tourist resort. 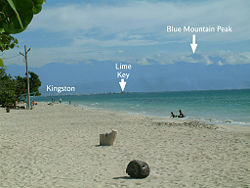 Kingston is surrounded by the Blue Mountains, Red Hills, and Long Mountain, and is sited on the alluvial Liguanea Plain located next to the Hope River. Jamaica has a tropical climate with year-round constant high temperatures ranging from 86°F (30°C) in January and 91.4°F (33°C) in July. Kingston lies on the dry area of the island, so rainfall is intermittent, coming in short, heavy showers followed by sunshine. The rainiest weather occurs in May and June, and later in October and November, sometimes extending into December. Tropical storms and hurricanes can occur between July and November. Average annual precipitation is 51.45 inches (1307 mm). A great deal of Kingston is pure shanty town. Two parts make up the central area: the historic but troubled Downtown, used mostly by the low-income population, and New Kingston, a business area which embodies modern tropical town planning, combining high rise buildings and well-groomed gardens with the Blue Mountains as a backdrop. The original waterfront area along Harbour Street was re-developed in the 1990s. Shipping moved to Newport West, adjacent to the extensive Kingston Industrial Estate. The city’s wealthy residents live in the suburbs to the north of Kingston, closer to the Blue Mountains. An Arawak village. Along with the Taino, the Arawak inhabited the island of Jamaica as early as 4000 B.C.E. 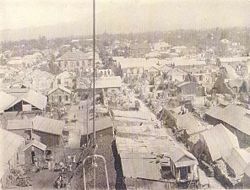 Bird's eye view of Kingston after the 1907 earthquake. View of the Uptown New Kingston skyline, in 2007. 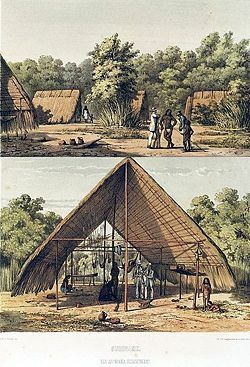 The Arawak and Taino indigenous people originating from South America settled Jamaica between 4000 and 1000 B.C.E. Jamaica was claimed for Spain after Christopher Columbus first landed there on May 3, 1494, and adopted the island as his family's private estate. At that time there were over 200 villages ruled by chiefs or caciques, with the south coast of Jamaica being the most populated, especially around what is now known as Old Harbour. The British Admiral William Penn, father of William Penn of Pennsylvania, and General Venables, seized the island for England nearly 200 years later, in 1655. On July 22, 1692, an earthquake and tidal wave destroyed two-thirds of Port Royal, located at the mouth of the harbor. Survivors fled to the nearby Colonel Barry's Hog Crawle, a place where pigs were kept, and set up a refugee camp on the sea front. This led to the deaths of about 2,000 people from mosquito-borne diseases. In May 1693, the local assembly declared Kingston a parish, although it was not until a fire in 1703 destroyed Port Royal that Kingston began to grow. The town plan done on a grid, was drawn up by John Goffe, a surveyor. By 1716, Kingston became the largest town on Jamaica, and the center of the island's trade. The first free school, Wolmer's, was founded in 1729. Two theaters were built during this time, on Harbour Street and North Parade; both are still in existence. In 1755, the governor had decided to transfer the government offices from Spanish Town to Kingston. It was thought by some to be an unsuitable location for the Assembly, in close proximity "to the moral distractions of Kingston," and the next governor rescinded the Act. At the time of the American War of Independence (1775-1783), Kingston had a population of 11,000, which was nearly two-thirds the size of Boston's population of 18,000, with more than 3000 brick buildings in the city. The town was a prosperous trans-shipment port for goods from England to the Spanish colonies. Britain kept slaves in Kingston until they were sent to Latin America. Merchants began lobbying for the administrative capital to be transferred from Spanish Town, which was by then eclipsed by the commercial activity in Kingston. It would be nearly a century before the city took on that role. The colony's slaves, who vastly outnumbered their white masters by a ratio of 20:1 in 1800, had mounted over a dozen uprisings throughout much of the eighteenth century, including Tacky's Revolt in 1760. Escaped slaves, known as Maroons, established communities in the mountainous interior. One Maroon community, expelled from the island after the Second Maroon War in the 1790s, formed the core of the creole community of Sierra Leone. Slavery ended in Jamaica on August 1, 1834, with the passing of the British Emancipation Act, which led to emancipation on August 1, 1838, the date upon which former slaves became free to choose their employment and employer. During the slave era, Jamaica became one of the world's leading sugar exporting nations. Between 1820 and 1824, the island produced over 77,000 tons of sugar annually. In addition to the massive use of imported African slave labor, the British brought in Indian and Chinese indentured servants in the early 1800s. In 1862, Kingston became a corporation with a mayor and council with powers to make laws and regulations. A fire that year left a large part of the city in ruins. The Morant Bay Rebellion, which broke out on October 11, 1865, after a black man was put on trial and imprisoned for trespassing on an abandoned plantation, led to 439 black Jamaicans being killed by soldiers, and 354 more being arrested and later executed, some without proper trials. The scale of the crackdown on the rebels provoked wide debate, and in 1866, the Jamaican legislature renounced its powers, and the country became a crown colony. Some measure of self-government was restored in the 1880s, when islanders gained the right to elect nine members of a legislative council. In 1872, the capital was moved to Kingston, as the port city had far outstripped the inland Spanish Town in size and sophistication. The powers of the Kingston council were transferred to a nominated Municipal Board but by 1885, the affairs of the city were again administered by a mayor. In 1882, fire destroyed 40 acres in the residential and commercial areas of Kingston. An earthquake in 1907 killed 800 people and destroyed most buildings south of the parade. Subsequently, buildings in the central business district were restricted in height to no more than 60 feet (18 m). These three-storey buildings were built with reinforced concrete. The Great Depression had a serious impact during the 1930s. In the spring of 1938, sugar and dock workers around the island rose in revolt. Although the revolt was suppressed it led to the emergence of an organized labor movement and political parties. In 1948, the Mona campus of the University of the West Indies was founded with 24 medical students. In 1958, Jamaica joined nine other United Kingdom territories in the Federation of the West Indies but withdrew in 1961 after Jamaican voters rejected membership. Jamaica gained independence on August 6, 1962, remaining a member of the Commonwealth of Nations. The first prime minister was Alexander Bustamante of the Jamaica Labour Party. By the 1980s, most of Kingston's old wharves had been demolished to make way for hotels, shops, offices, a cultural center, and docks for cruise and cargo ships. During the 1990s Kingston made efforts to modernize and develop it's city structure and functions. Jamaica is a constitutional parliamentary democracy in which the chief of state is the hereditary English monarch, represented by an appointed governor general, and the head of government is the prime minister. After legislative elections, the leader of the majority party or coalition is appointed prime minister by the governor general. 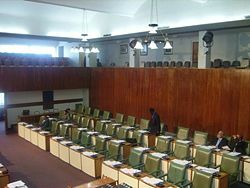 The bicameral parliament consists of the Senate, which is a 21-member body appointed by the governor general on the recommendations of the prime minister and the leader of the opposition, and the House of Representatives, which comprises 60 members who are elected by popular vote to serve five-year terms. Jamaica is divided into 14 parishes, which are grouped into three historic counties that have no administrative relevance. Parishes have been a feature of local administration in Jamaica since the island was captured by the English in 1655. Twelve parishes are administered by popularly elected councils, and the remaining parishes are administered by elected commissions. The local government bodies of the parishes of Kingston and St. Andrew were amalgamated by the Kingston and St. Andrew Corporation Act of 1923, to form the Kingston and St. Andrew Corporation. The migration of unemployed people to urban areas, coupled with an increase in the use and trafficking of narcotics—crack cocaine and ganja (marijuana)—contribute to a high level of violent crime, especially in Kingston. Parts of Kingston and some slum areas in other towns are controlled by gang leaders, called "dons," who derived their power initially from links to the leadership of the political parties, but over the course of the 1980s and 1990s acquired significant independence due to participation in the transshipment of cocaine from South America to North America and Europe and the export of Jamaican marijuana. View of the Downtown Kingston waterfront showing the Bank of Nova Scotia and the Bank of Jamaica. The Jamaican economy is heavily dependent on services, which account for more than 60 percent of gross domestic product. The country continues to derive most of its foreign exchange from tourism, remittances, bauxite/alumina, and sugar, the leading export crop. Remittances account for nearly 20 percent of GDP and are equivalent to tourism revenues. Jamaica's economy, already saddled with a record of sluggish growth, faces serious long-term problems: High but declining interest rates, increased foreign competition, exchange rate instability, a sizable merchandise trade deficit, plus large-scale unemployment and underemployment. Jamaica's onerous debt burden—the fourth highest per capita—is the result of government bailouts to ailing sectors of the economy, most notably the financial sector in the mid-to-late 1990s. Per capita GDP was estimated at $7400 in 2007. 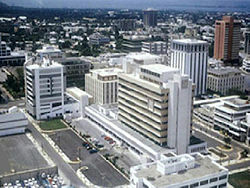 Kingston, as the capital, is the financial, cultural, economic and industrial center of Jamaica. 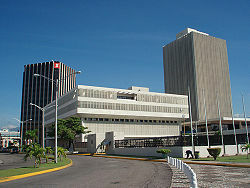 Numerous financial institutions are based in Kingston, and the city boasts the largest number of hospitals, schools, universities and cultural attractions of any urban area on the island. Blue Mountain coffee, grown near Kingston, is considered among the best in the world because at those heights the cooler climate causes the berries to take longer to ripen and the beans develop more of the substances which on roasting give coffee its flavor. Coffee, which formed 1.9 percent of exports in 1999, is exported from Kingston. Tourism is the principal earner of foreign exchange which earns over $1-billion each year. The tourist economy employs hundred of thousands of Jamaicans. Most tourist activity is centered on the northern coast of the island and in the communities of Montego Bay, Port Antonio and Kingston. Since the 1980s, apparel production became the dominant manufacturing activity in Jamaica, and production was greatly increased when U.S. companies began outsourcing apparel assembly to countries such as Jamaica, where labor was cheaper. An oil refinery located near Kingston converts crude petroleum obtained from Venezuela into gasoline and other products. A government-owned railway connecting Kingston to most of Jamaica’s 14 parishes operated until 1992, closed by lack of funding and low use. A few rail lines continue to transport bauxite. Kingston is served by Norman Manley International Airport and also by the smaller and primarily domestic Tinson Pen Aerodrome. A view of uptown Kingston, Jamaica, showing the New Kingston night scene, in 2008. The majority of the population of Kingston is of African descent. East Indians are the second largest ethnic group, followed by Chinese, European, and Arab (primarily Lebanese). A small number of Hispanics, mostly from Latin America, live there. English and English patois, a "broken" or incorrect Standard English, are the spoken languages. There are a wide variety of Christian churches in the city. Most (62.5 percent) were Protestant in the 2001 census, a legacy of British colonization of the island. Seventh-Day Adventists made up 10.8 percent of Jamaica's faithful, Pentecostal 9.5 percent, Other Church of God 8.3 percent, Baptists 7.2 percent, New Testament Church of God 6.3 percent, Church of God in Jamaica 4.8 percent, Church of God of Prophecy 4.3 percent, Anglican 3.6 percent, and other Christian churches 7.7 percent. Roman Catholics made up 2.6 percent, other or unspecified 14.2 percent, and those with no religion 20.9 percent. Afro-Christian syncretic religions are widespread. The largest non-Christian movement is the Rastafari, a monotheistic, Abrahamic, new religious movement founded on the island that accepts Haile Selassie I, the former Emperor of Ethiopia, as the incarnation of God. There is a Jewish synagogue in Kingston, as well as a large number of Buddhists and Muslims. The University of the West Indies, which is a major higher learning institute for the Caribbean region, is located at Mona, five miles (eight kilometers) from Kingston’s city center. The University of Technology is located in Kingston. The Bob Marley Museum, dedicated to the reggae musician Bob Marley (1945–1981), is one of a number of landmarks in Kingston. The museum, which was Marley's place of residence, was home to the Tuff Gong record label which was founded by The Wailers in 1970, and in 1976, was the site of a failed assassination attempt on Marley. The National Gallery of Jamaica, located in the Kingston Mall, a commercial and cultural center on Kingston Harbour, that holds Jamaica's premier art collection, including works by Mallica "Kapo" Reynolds, Cecil Baugh, Albert Huie, Carl Abrahams, and Edna Manley. The Church of St. Thomas, that was built before 1699 and rebuilt after the 1907 earthquake. Rockfort, a moated fortress dating from the late 17th century and last manned in 1865. Headquarters House, the former seat of government, that was built by Thomas Hibbert, an eighteenth century merchant, and is one of the few remaining architectural relics of a city once famous for fine houses. Devon House, a mansion with adjoining park that once belonged to Jamaica's first black millionaire. The Royal Botanical Gardens, located at nearby Hope. Several reggae stars, including Buju Banton, Sean Paul, Bounty Killer, and Beenie Man, hail from Kingston. Several annual and well-visited festivals are held in Kingston. Although Kingston is on the international tourist circuit, and is the hub of world reggae music, high unemployment exacerbates a serious crime problem there, including gang violence that is fueled by the drug trade. The Jamaican government faces the difficult prospect of having to achieve fiscal discipline in order to maintain debt payments while simultaneously attacking a serious and growing crime problem that is hampering economic growth. ↑ The Armorial Bearings of The Kingston and St. Andrew Corporation Kingston & St Andrew Corporation. Retrieved April 30, 2012. ↑ Dhana Tours, Kingston, Jamaica. Retrieved January 7, 2009. ↑ Gina Nicholas, May 2003, Brief History, Structure and development of Kingston, Jamaica. Retrieved January 7, 2009. ↑ 4.0 4.1 Glenn Woodley, April 1, 2001, The Taino of Jamaica, Jamaicans.com. Retrieved January 7, 2009. ↑ Wolmer's Schools, 2003, Wolmer's Boys School History. Retrieved January 7, 2009. This page was last modified on 19 April 2018, at 15:14.